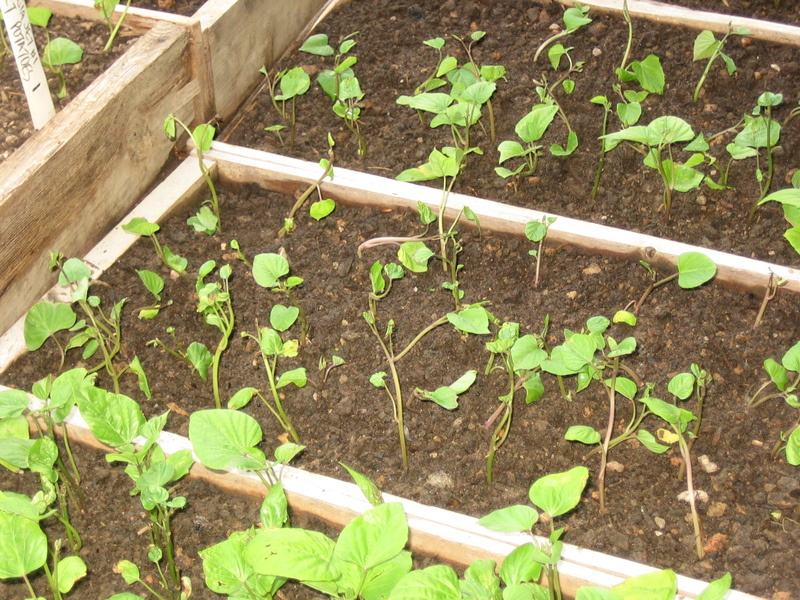 Growing sweet potato slips from roots planted in flats of compost. The weather outside is still full of rain, but I’m optimistically starting growing our own sweet potato slips. Surely it will dry out by May? growth, flowering and dying back, sweet potato plants would continue growing forever if the weather was warm enough. Sweet potatoes are not grown from seed or from replanted roots, but from “slips,” which are pieces of stem with a few leaves, grown from a mother root. We used to buy bare-root sweet potato slips to plant, believing growing our own would be very tricky. 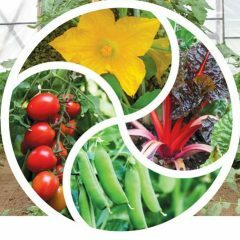 The collapse of our supplier and our desire to have organic plants (plus a need to reduce our expenses one year), pushed us into growing our own. We had some problems initially, so I can warn you about how not to do it. Now we have a system we really like, and we’ve found several advantages of homegrown slips over purchased ones. With purchased slips, we had to specify a shipping date months ahead, then hope the weather sprites would be kind. We had to jump to when the plants arrived, and get them all in the ground pronto, to keep them alive as best we could (because their roots needed moisture). We accepted as normal a certain amount of drooping. We can have late frosts, spring droughts or El Niño wet springs, and climate change is only adding to the uncertainty. 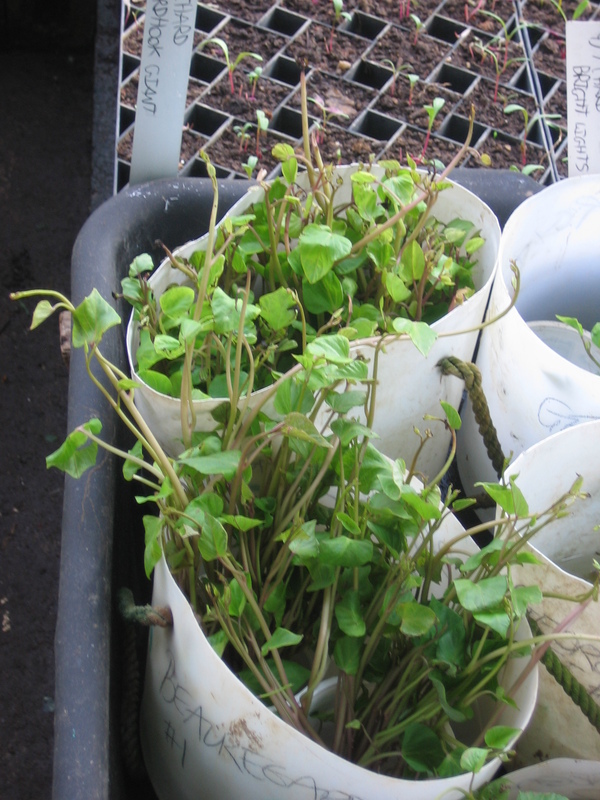 With homegrown slips we can delay planting if that seems wise; we can plant them in stages rather than all on one day. The transplants don’t wilt. We can grow them big and plant them with three to five nodes underground, giving more chance of survival in heat or frost. We can keep some spares on hand to replace casualties. The sturdy plants get off to a strong start, which could be an even bigger advantage further north where the season of warm-enough weather is on the short side for a 90–120-day plant. And we are self-reliant — we never have to spend money on them. Figure out your ideal planting date and work back to find your starting date. Planting is usually done about two weeks after the last frost. The soil temperature should reach at least 65°F (18°C) at 4″ (10 cm) deep on four consecutive days. For us, that’s around May 12. It takes eight weeks to grow the slips, and the roots produce more slips if conditioned for two weeks (or even four), before you start to grow slips. So start ten to twelve weeks before your planting date. We now start March 1. Here’s where I made my first big mistake — following directions written for much further south, I tried to start growing slips in mid-January. Dismal fight against nature! If you want to get the best yields from your mother roots, first test the roots in a bucket of water — the ones that float are said to yield better and produce better-flavored roots. Next, test for viral streaking — also known as color breaks or chimeras, where paler spots or radial streaks appear in the flesh — and discard roots with pale spots or streaks wider than a pencil lead. Cut a thin slice from the distal end of each root — the stringy root end, opposite the end that was attached to the plant stem. All the sprouts will grow from the stem end, so don’t cut there! If you can’t tell the difference between the ends, you can ignore this step and plan not to propagate your own slips for more than a couple of years (so the virus load doesn’t get too high). 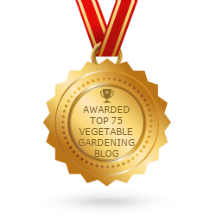 Or if you are a home gardener dealing with a small crop, you could keep the slips from each root separately and cut up the mother root before planting and then discard the slips from streaked roots. Put the chosen roots in flats, boxes or trays, without soil, in a warm, moist, light place for two to four weeks. Ideal conditions are 75°F–85°F (24°C–29°C) at 95% humidity. This can double or triple the number of sprouts the root will produce in a timely manner. We use our germinating chamber, which is an old glass door refrigerator heated by a light bulb. See the photo above. Conditioning after testing allows the cut surfaces to heal before they are covered by compost. The environment for sprouting the roots is similar, so you can probably use the same location. Set up a place with light, humidity and ventilation at 75°F–85°F (24°C—29°C) and with about 12″ (30 cm) of headroom. Plant the selected roots almost touching each other, horizontally in free-draining light potting compost in flats or crates. Water the boxes and put them to sprout. Once again, we use our ex-fridge germinator. 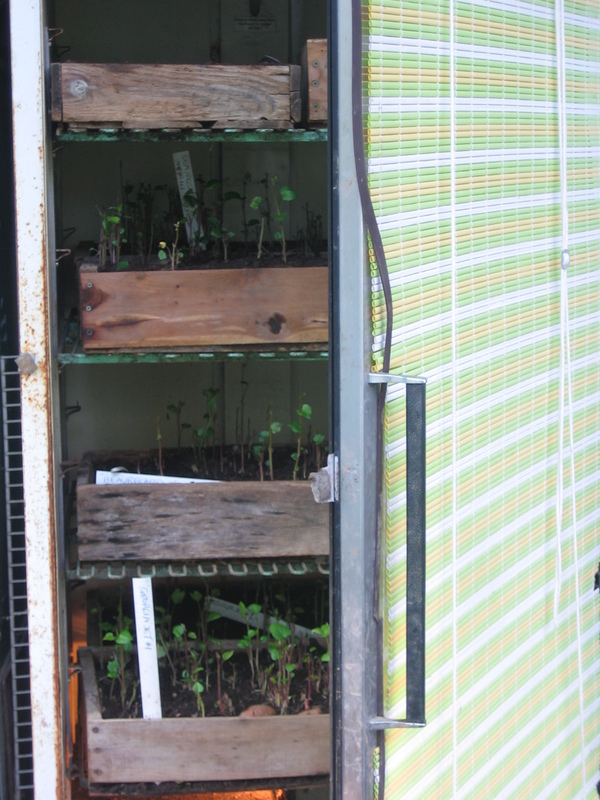 Using boxes is much more manageable than having the roots loose in a big coldframe. Indoor spaces are much easier to heat than the great outdoors! Boxes can be insulated and put on a bench at a decent working height, with lights or heat lamps over them. Keep the compost damp, and if your planting medium is without nutrients, give liquid feed occasionally once sprouting starts. For small quantities of slips, it is possible to sprout the potatoes half-submerged in water, either in trays of water or by suspending a sweet potato impaled on toothpicks, resting on the top of a glass of water. For larger quantities I recommend our method. Cut sweet potato slips put in water to grow roots. After 5–7 days, the roots will begin to produce slips. Ideally, wait until the slips are 6″–12″ (15–30 cm) tall with 4–6 leaves beginning, then cut them from the root and stand them in water. If necessary, cut them a bit shorter. Some people pull or twist the slips from the roots, but this could transfer diseases by bringing a small piece of the root with the sprout. I cut the slips daily, bunch them in a rubber band and stand them in a small bucket of water. The slips will grow more roots while they are in water for several days, which seems to be an advantage. Once a week I spot (plant) the oldest, most vigorous slips (with good roots) into 4″ (10-cm) deep wood flats filled with compost. The spotted flats require good light in a frost-free greenhouse and sufficient water. If you are two weeks away from your planting date and are short of slips, you can take cuttings from the first flats of slips that were spotted, to make more. The slips planted in flats become very sturdy, allowing flexibility about planting dates and a longer slip-cutting season. About ten days before planting, start to harden off the flats of slips by reducing the temperature and increasing the airflow. It’s also possible to skip the spotting stage and transplant the slips outside directly from the water, but I don’t think this is as good as spotting them into flats of good compost for a few weeks. Once a week we plant the rooted slips in flats. Nice information on growing slips. I too just started doing this this year to reduce costs. Previous Previous post: Snow, no electricity, now rain! Next Next post: Upcoming Events I’m presenting workshops at.